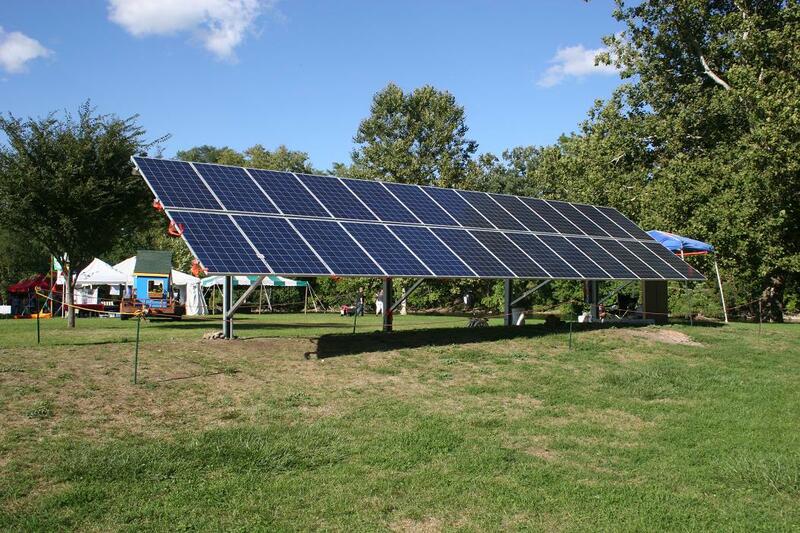 The 6KW solar installation at the Ypsilanti Heritage Festival was a success! Many thanks to Stefan Graf for letting us “borrow” his system before it got installed at his house. Steve Pierce and myself staffed the booth with some help from Paul Haas. We basically talked non-stop from festival opening to when security kicked us out. I heard that 5,000 people attended the festival. I’d say that most of them walked by and stared in our direction and that about 800 people actually walked over to chat. We would get groups of 6 to 12 people standing around learning about solar power. Most were shocked to hear that the installation was only temporary and that we were not “selling” anything. 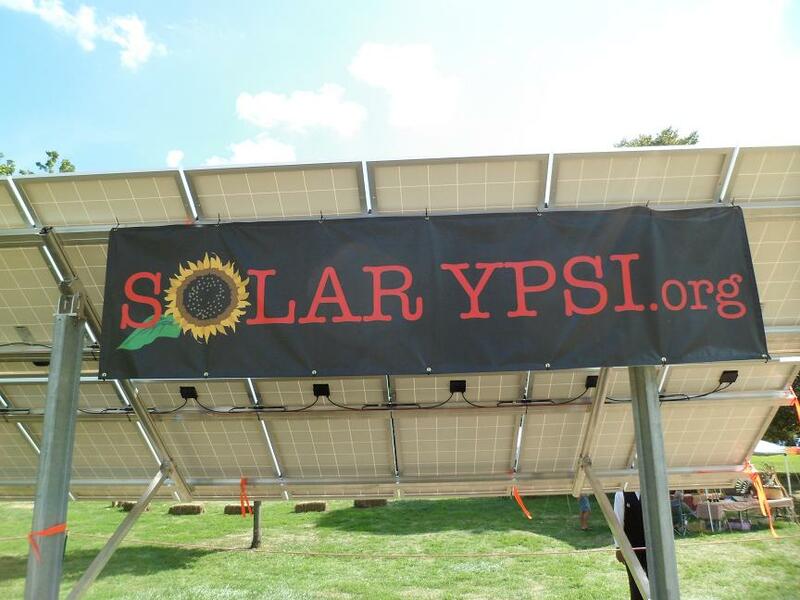 We quickly ran out of business cards for a local solar contractor, John Wakeman, at S.U.R. Energy and his literature about reaching 25% renewable energies by 2025 in Michigan. Thanks to Stef and Robert from the Ypsi Food Co-op , Steve Pierce, Dave Alber, and John Wakeman for helping with the install. it took four people about a day and a half to get it up and running. I was unfamiliar with these inverters and it took us a while to figure out how to get them started. Turned out we forgot to install a part. Duh! The festival started at 12:00 on Friday and we got the inverters running at 12:04. Thanks to Chris Simmons at DPS for helping us connect the system to the park’s electrical system. I read one of the park’s electric utility meters before and after the festival and calculate they we provided about 10% of the festival’s power. It’s hard to get an accurate number since I saw a few generators and there was one meter I didn’t know about till after the festival. According to the inverters we produced 101 KWH over the weekend. 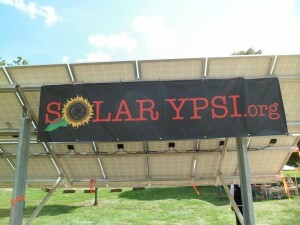 Thanks to Corinne Sikorski and the Ypsi Food Co-op for loaning us the tent and for the new SolarYpsi banner. I’m sure we’ll get a lot of use out of that. Thanks also goes to Paula, my spouse, for shuttling food, tools, and parts to our booth. After the festival it took us about three hours to take it all down and pack it into the truck. Thanks again to Stefan Graf and his guys from Fantasee Lighting for trucking the material to and from the festival. Steve Pierce took a lot of pictures of the tear down which is fun to watch in slide show mode. Click here and then click on the Details tab to see them. Clicking on any picture will put it into slide show mode. Stefan’s solar panels are now happily installed, in concrete, at his house. If we want to do this again next year, we’ll have to find another set of solar panels to “borrow”. Anyone planning a solar installation next August?